At first I casually thought to myself, “I want to wear a kimono!”. It was just after this that I started to wear kimonos. As a student I worked part-time at a Tempura restaurant, where I had to wear a kimono.I was able wear a kimono on my own, but I had no real opportunity to wear one for five years after that. One day, I happened upon a waitressing job. The restaurant needed an extra waitress for the Golden Week holidays. By then I had forgotten how to wear a kimono. Each day, as I wore a kimono, people praised me for wearing it neatly. I was happy to hear that. 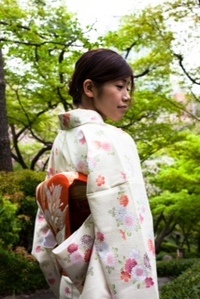 When I wore a kimono, I had a good posture and I knew how I should behave as a woman. but also improved my confidence (gave me inner strength). It’s the reason why I started wearing Kimonos.